(Nanowerk Spotlight) Numerous pathogens can cause bloodstream infections (sepsis) and the most straightforward cure is to remove the disease-causing factors from a patient's blood as quickly as possible. Several methods, like dialysis and plasma filtration/exchange, are already widely and routinely applied for this purpose. Demonstrating a novel use of nanomagnets, researchers in Switzerland have rapidly and selectively removed heavy metal ions, overdosed steroid drugs and proteins from human blood. This nanomagnet-based purification method avoids fouling of filter membranes and benefits from a high external surface area, and a correspondingly fast diffusion. "By using magnetic metal nanomagnets carrying target-specific ligands, we showed that blood purification at a nano- to pico-molar scale is possible," Wendelin Stark, an Associate Professor at the Institute for Chemical and Bioengineering of the ETH Zurich, tells Nanowerk. "Toxins or pathogens can be selectively removed from whole blood within minutes. Functionalized nanomagnets can access substances of different masses and sizes whereas other blood purification techniques available on the market are hampered by filter cut offs or slow pore diffusion in membranes. By contrast, the large, yet rapidly accessible surface of the nanomagnets enables efficient adsorption," explains Inge Herrmann, a PhD-student in Stark's Functional Materials Laboratory and first author of a recent paper in Small ("Blood Purification Using Functionalized Core/Shell Nanomagnets") that investigates the direct injection of stable nanomagnets into whole blood for the efficient, magnetic-extraction-based extracorporeal removal of low- and high-molecular-weight compounds. The work was carried out in close collaboration with the group of Professor Beatrice Beck-Schimmer from the University Hospital Zurich. "Magnetic blood purification requires high-strength nanomagnets (blood is viscous), reliable functionalization (no loss of ligands; high accessibility), mixing, and particle collection after target binding," explains Herrmann. "In a typical experiment, we added predispersed nanomagnets to fresh human whole blood. During gentle swinging, the nanomagnets scanned the liquid – driven by Brownian motion – and captured the target compounds." 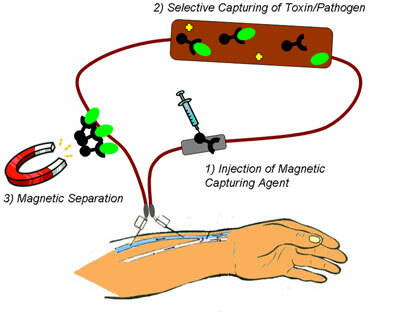 For their experiments, the ETH team synthesized carbon-coated iron carbide nanomagnets with a mean diameter of 30 nanometers and subsequently functionalized them with linker molecules and selective capturing moieties such as antibodies. After the nanomagnets acquired their targets, a small magnet was placed at the sample tube wall accumulating the nanomagnets in the pole region of the external magnet. The purified supernatant can then easily be decanted. A wide range of substances of different chemical nature can be accessed with this method – metal ions, small drug molecules, proteins. This technique also offers the potential to simultaneously remove compounds very different in mass and size. Furthermore, the nanomagnets can be accurately dosed. The team is already working on a continuous implementation of magnetic blood purification regarding later applications in clinics. Parts of the metal nanomagnet technology are now being commercialized by an ETH spin-off company Turbobeads.